We had a great 40th Reunion. Check our Facebook group for photos and more. 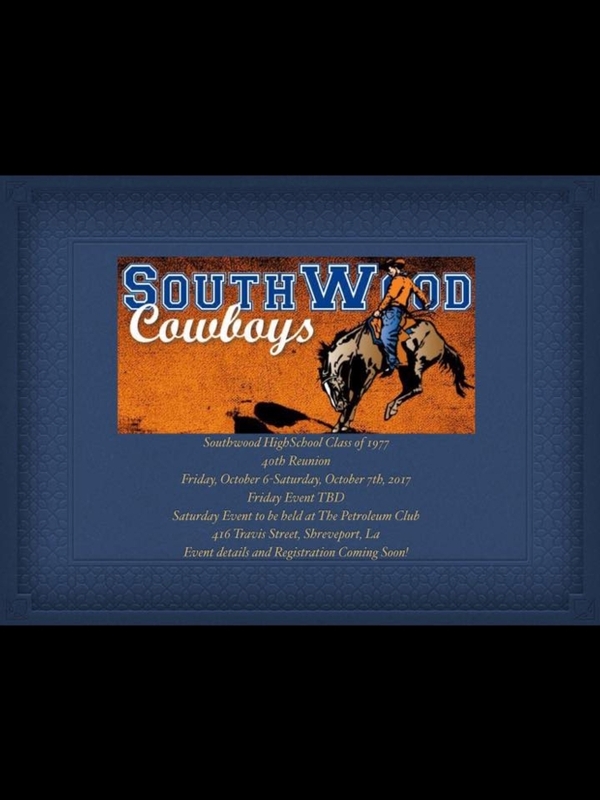 It is time again for a reunion for the Southwood Cowboys Class of 1977. It has been 40 years since we graduated and it is time for us to get reacquainted! Please join us for our 40th high school reunion on Friday, October 6th through Saturday, October 7th. 8p-11p Live Music with Ambush playing the greatest hits from 1977! Our 40 Year Reunion is this year (2017)! Please create a profile here to help us contact you with all the details. We have a date and a venue! Make your plans to join us October 6-7, 2017. The location for Friday, October 6 is still to be determinted. On Saturday, October 7 we will be at the Petroleum Club (416 Travis Street, Shreveport, LA 71101).